Marathi (English pronunciation: /mÉËrÉ'Ëti/; à¤®à¤°à¤¾à¤ à¥ MarÄá¹­hÄ« [mÉËÉ¾aÊÊ°i]) is an Indo-Aryan language. It is the official language and co-official language in Maharashtra and Goa states of Western India respectively. and is one of the 23 official languages of India. There were 73 million speakers in 2001; Marathi ranks 20th in the list of most spoken languages in the world. Marathi has the fourth largest number of native speakers in India. Marathi has some of the oldest literature of all modern Indo-Aryan languages, dating from about 1000 AD. The major dialects of Marathi are Standard Marathi and the Varhadi dialect. There are other related languages such as Khandeshi, Dangi, Vadvali and Samavedi. Malvani Konkani has been heavily influenced by Marathi varieties. Marathi is one of several languages that descend from Maharashtri Prakrit. Further change led to the Apabhraá¹Åa languages like Old Marathi. Marathi literature began and grew owing to the rise of both the Seuna dynasty of Devgiri, who adopted Marathi as the court language and patronized Marathi scholars, and two religious sects - the Mahanubhava and Varkari panthans, who adopted Marathi as the medium for preaching their doctrines of devotion. Marathi had attained a venerable place in court life by the time of the Seuna kings. During the reign of the last three Seuna kings, a great deal of literature in verse and prose, on astrology, medicine, Puranas, Vedanta, kings and courtiers were created. Nalopakhyan, Rukmini swayamvar and Shripati's Jyotishratnamala (1039) are a few examples. The oldest book in prose form in Marathi, VivÄ"kasindhu (à¤µà¤¿à¤µà¥à¤à¤¸à¤¿à¤à¤§à¥), was written by Mukundaraja, a Nath yogi and arch-poet of Marathi. Mukundaraja bases his exposition of the basic tenets of the Hindu philosophy and the yoga marga on the utterances or teachings of Shankaracharya. Mukundaraja's other work, Paramamrta, is considered the first systematic attempt to explain the Vedanta in the Marathi language. Notable examples of Marathi prose are "LÄ«á¸·ÄcarÄ«tra" (à¤²à¥à¤³à¤¾à¤à¤°à¥à¤¤à¥à¤°), events and anecdotes from the miracle filled life of Chakradhar Swami of the Mahanubhava sect compiled by his close disciple, Mahimbhatta, in 1238. The LÄ«á¸·ÄcarÄ«tra is thought to be the first biography written in the Marathi language. Mahimbhatta's second important literary work is the Shri Govindaprabhucharitra or Rudhipurcharitra, a biography of Shri Chakradhar Swami's guru, Shri Govind Prabhu. This was probably written in 1288. The Varkari saint-poet Eknath lived from 1528â"1599. Mukteshwar translated the Mahabharata into Marathi; Tukaram (1608â"49) transformed Marathi into a rich literary language. His poetry contained his inspirations. Tukaram wrote over 3000 abhangas or devotional songs. He was followed by Samarth Ramdas. Writers of the Mahanubhava sect contributed prose while the Varkari composed poetry. One of the famous Nath saints of this period was Dnyaneshwar (1275â"1296), who wrote the Bhavarthadipika (1290), and Amritanubhava. He also composed abhangas. Dnyaneshwar gave a higher status to Marathi by translating the Bhagavad Gita. Sant Dyaneshwar wrote largest treaty of the initial time A D 1290 titled Dyaneshwari. later, Saint Tukaram made important contributions to Marathi poetic literature in Warkari Pantha. Saints like Samartha Ramdas (Dasboth), Sant Namdev (his marathi couplets were even taken to Punjab), Moropant (creator of 'Aryas") and many others created famous literary works in Marathi. Marathi also became language of administration during the Nizamshahi of Ahmadnagar. Adilshahi of Bijapur also used Marathi for administration and record keeping. After Indian independence, Marathi was accorded the status of a scheduled language on the national level. On 1 May 1960, Maharashtra was re-organised along linguistic lines adding Vidarbha and Marathwada region in its fold and thus bringing major chunks of Marathi population socio-politically together. With state and cultural protection, Marathi made great strides by the 1990s. Notable works in Marathi in the latter half of 20th century includes Khandekar's Yayati which won him, the Jnanpith Award. Also Vijay Tendulkar's plays in Marathi have earned him a reputation beyond Maharashtra. P.L.Deshpande(PuLa), P.K.Atre & Prabodhankar Thackeray, were also known for their writings in Marathi in the field of Drama, comedy and Social commentary. A literary event called Akhil Bharatiya Marathi Sahitya Sammelan (All-India Marathi Literature Meet) is held every year. In addition, the Akhil Bharatiya Marathi Natya Sammelan (All-India Marathi Theatre Convention) is also held annually. Both events are very popular amongst Marathi speakers. It was in 1958, that the term "Dalit literature" was used for the first time, when the first conference of Maharashtra Dalit Sahitya Sangha (Maharashtra Dalit Literature Society) was held at Mumbai, a movement inspired by 19th century social reformer, Jyotiba Phule and eminent dalit leader, Dr. Bhimrao Ambedkar. Baburao Bagul (1930â"2008) was a pioneer of Dalit writings in Marathi. His first collection of stories, Jevha Mi Jat Chorali (à¤à¥à¤µà¥à¤¹à¤¾ à¤®à¥ à¤à¤¾à¤¤ à¤à¥à¤°à¤²à¥) (When I Concealed My Caste), published in 1963, created a stir in Marathi literature with its passionate depiction of a cruel society and thus brought in new momentum to Dalit literature in Marathi. Gradually with other writers like, Namdeo Dhasal (who founded Dalit Panther), these Dalit writings paved way for the strengthening of Dalit movement. Notable Dalit authors writing in Marathi include Arun Kamble, Shantabai Kamble, Raja Dhale, Namdev Dhasal, Daya Pawar, Annabhau Sathe, Laxman Mane, Laxman Gaikwad, Sharankumar Limbale, Bhau Panchbhai, Kishor Shantabai Kale, Narendra jadhav, and Urmila Pawar. Jhadi Boli or Jhadiboli is spoken in Jhadipranta (Forest rich region) of far eastern Maharashtra or eastern Vidarbha or western-central Gondvana comprising Gondia, Bhandara, Chandrapur, Gadchiroli and some parts of Nagpur and Wardha districts of Maharashtra. Zadi Boli Sahitya Mandal and many literary are working for the conservation of this important and distinct dialect of Marathi. 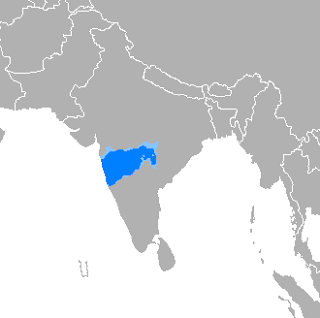 Thanjavur Marathi, Namdev shimpi Marathi and Bhavsar Marathi are spoken by many Maharashtrians in Southern India. This dialect is stuck in the 17th century and is old Marathi - it did not change from the time the Marathas conquered Thanjavur and Bangalore in southern India. It has speakers in parts of Tamil Nadu, Andhra Pradesh and Karnataka. Older aspirated *tsÊ°, dzÊ± have lost their onset, with *tsÊ° merging with /s/ and *dzÊ± being typically realized as an aspirated fricative, [zÊ±]. This /ts, dz, zÊ±/ series is not distinguished in writing from /tÊ, tÊÊ°, dÊ', dÊ'Ê±/. and à¤'. The IPA signs for these are [Ã¦] and [É'], respectively. Marathi retains the original Sanskrit pronunciation of certain letters such as the anusvÄra (for instance, saá¹har, compared to sanhar in Hindi). Moreover, Marathi preserves certain Sanskrit patterns of pronunciation, as in the words purá¹a and rÄma compared to purá¹ and rÄm in Hindi. From the thirteenth century until 1950, Marathi, especially for business use, was written in Modi script â" a cursive script designed for minimising the lifting of pen from paper while writing. Currently, due to the availability of Modi fonts and the enthusiasm of the younger speakers, the script is far from disappearing. (See Reference Links). Since Devanagri was difficult to type on Latin keyboards and Devanagri does not display properly on old computers without the proper fonts, the general public used to type Marathi in Latin on social networking sites like Facebook and in online chats. Since it was a new trend there was no standardisation of phonetic and spelling rules. This trend seems to have saturated and is on the decline due to widespread support of Unicode and the availability of easy to use Devanagari transliteration on modern computers. In Marathi, the consonants by default come with a schwa. Therefore, à¤¤à¤¯à¤¾à¤à¥ will be 'tÉyÄche', not 'tyÄche'. To form 'tyÄche', you will have to add à¤¤à¥ + à¤¯à¤¾à¤à¥, giving à¤¤à¥à¤¯à¤¾à¤à¥. à¤¤à¥à¤¯à¤¾à¤à¥ - tyÄche - "his"
à¤ªà¥à¤°à¤¸à¥à¤¤à¤¾à¤µ - prastÄv - "proposal"
à¤µà¤¿à¤¦à¥à¤¯à¤¾ - vidyÄ - "knowledge"
à¤®à¤¹à¤¤à¥à¤¤à¥à¤µ - mahatva - "importance"
à¤«à¤à¥à¤¤ - phakta - "only"
à¤¬à¤¾à¤¹à¥à¤²à¥à¤¯à¤¾ - bÄhulyÄ - "dolls"
In writing, Marathi has a few digraphs that are rarely seen in the world's languages, including those denoting the so-called "nasal aspirates" (á¹h, nh, and mh) and liquid aspirates (rh, á¹h, lh, and vh). Some examples are given below. à¤¨à¥à¤¹à¤¾à¤£à¥ - nhÄá¹e - "bath"
à¤®à¥à¤¹à¤£à¥à¤¨ - mhaá¹Å«n - "because"
à¤¤à¤±à¥à¤¹à¤¾ - taá¹hÄ - "different way of behaving"
à¤à¥à¤²à¥à¤¹à¤¾ - kolhÄ - "fox"
Marathi grammar shares similarities with other modern Indo-Aryan languages such as Hindi, Gujarati, Punjabi, etc. The first modern book exclusively concerning Marathi Grammar was printed in 1805 by William Carey. Sanskrit Grammar used to be referenced until later stages of the development of the Marathi Language. The contemporary grammatical rules described by Maharashtra Sahitya Parishad and endorsed by the Government of Maharashtra are supposed to take precedence in standard written Marathi. Traditions of Marathi Linguistics and the above-mentioned rules give special status to 'Tatsam' (Without Change) words adapted from the Sanskrit language. This special status expects the rules for 'Tatsam' words to be followed as in Sanskrit grammar. This practice supports the Marathi Language with a large treasure of Sanskrit words to cope with demands of new technical words whenever needed. The primary word order of Marathi is SOV (subjectâ"objectâ"verb) An unusual feature of Marathi, as compared to other Indo-European languages, is that it displays the inclusive and exclusive we feature, common to the Austronesian languages, Dravidian languages, Rajasthani, and Gujarati. Over a period of many centuries the Marathi language and people came into contact with many other languages and dialects. The primary influence of Prakrit, Maharashtri, Apabhraá¹Åa and Sanskrit is understandable. At least 50% of the words in Marathi are either taken or derived from Sanskrit. Day-to-day spoken Marathi retains a noticeably higher number of Sanskrit-derived (tatsam) words compared to sister North-Indian languages like Hindi, and many of these words are more or less unchanged versions of their original Sanskrit counterparts. Examples of such words used more or less daily by Marathi speakers include nantar (from nantaram or after), purá¹a (purá¹am or complete, full, or full measure of something), ola (olam or damp), karaá¹ (karaá¹am or cause), puá¹£kaá¸· (puá¹£kalam or much, many), satat (satatam or always), vichitra (vichitram or strange), svatah (svatah or himself/herself), prayatna (prayatnam or effort, attempt), bhÄ«ti (from bhÄ«ti, or fear) and bhÄá¹á¸a (bhÄá¹á¸am or vessel for cooking or storing food). Others such as dÄr (dwÄram or door), ghar (gá¹ham or house), vÄgh (vyÄghram or tiger), paá¸·aá¹e (palÄyate or to run away), kiti (kati or how many) have undergone more modification. Marjii "wish" is derived from Persian "marzi"
A lot of English words are commonly used in conversation, and are considered to be totally assimilated into the Marathi vocabulary. These include "pen" (native Marathi lekhaá¹ii), "shirt" (sadaraa). Another method of combining words is referred to as samaas (from Sanskrit, "margin"). There are no reliable rules to follow to make a samaas. When the second word starts with a consonant, a sandhi can not be formed, but a samaas can be formed. For example, miith-bhaakar ("salt-bread"), udyog-patii ("businessman"), ashá¹­a-bhujaa ("eight-hands", name of a Hindu goddess), and so on. There are different names given to each type of samaas. As with other Indic languages, there are distinct names for the fractions 1â4, 1â2, and 3â4. They are paava, ardhaa, and pauá¹a, respectively. For most fractions greater than 1, the prefixes savvaa-, saaá¸e-, paavaá¹e- are used. There are special names for 3â2 (diiá¸) and 5â2 (aá¸ich). Every two-digit number after 18 (11 to 18 are predefined) is read backwards. For example, 21 is read à¤à¤-à¤µà¥à¤¸ (1-twenty). Also, a two digit number that ends with a 9 is considered to be the next tens place minus one. For example, 29 is à¤à¤à¥à¤£à¤¤à¥à¤¸/à¤à¤à¥à¤£à¤¤à¥à¤¸ (à¤à¤-à¤à¤£à¥-à¤¤à¥à¤¸)(Thirty minus one). Two digit numbers used before hazaara, etc. are written in the same way.